If you encounter flood waters, remember – turn around, don’t drown. Don’t drive through a flooded area. Keep generators outside and far away from windows, doors and vents. 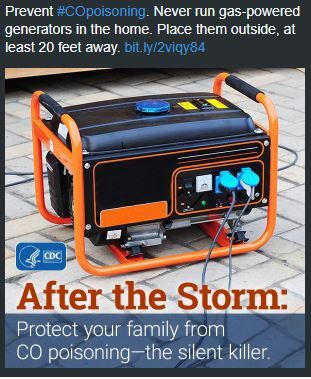 Read both the label on your generator and the owner’s manual and follow the instructions. Avoid plugging emergency generators into electric outlets or hooking them directly to your home’s electrical system – they can feed electricity back into the power lines, putting you and line workers in danger.